PRIMER QUE RES DONAR-VOS LES GRÀCIES PER LA VOSTRA ASSISTÈNCIA PERQUE SON POQUES LES OCASSIONS QUE TENIM DE JUNTAR-MOS COM A POBLE I VOSTRA PRESÈNCIA YA ÉS UNA RESPOSTA. ES MOLT IMPORTANT QUE TINGAM MOLT CLAR PERQUÉ ESTEM AÇÍ, PER EIXE MOTIU PER A DIRIGIR-ME A VOSATROS – QUE ÉS PER A MI UN HONOR – LLEGIRÉ UNES LLÍNEES, PER A QUE QUEDE CONSTÀNCIA. 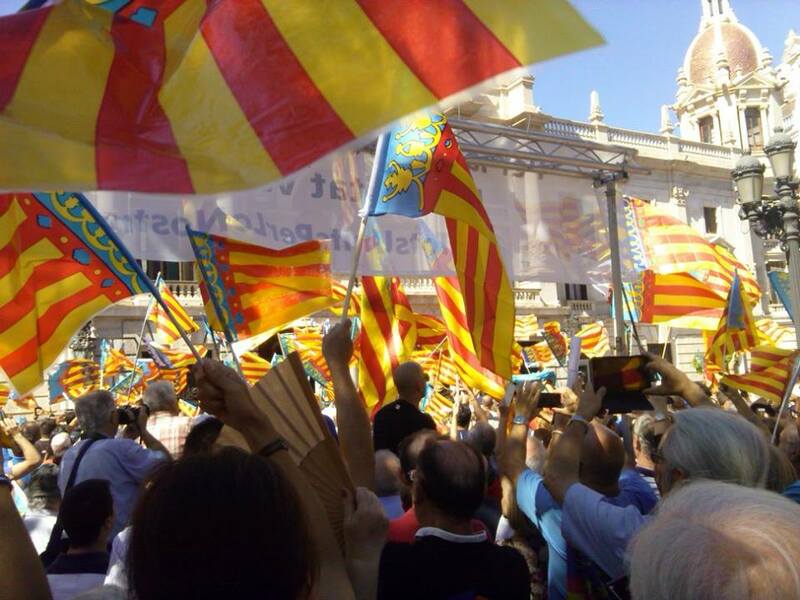 ACODIM HUI AÇI, A LA PLAÇA MAJOR DEL CAP I CASAL EN RESPOSTA A LA CRIDA QUE HAN FET LES ENTITATS VALENCIANISTES CONVOCANTS. I ESTA ES UNA CHICOTETA MOSTRA DE NOSTRE ENNUIG. I ESTEM AÇÍ A PESAR DEL BOICOT, LES DIFICULTATS I ELS SILENCIS DELS GRUPS DE PRESSIÓ INTERESSATS EN QUE EL POBLE NO S´ENTERE DE LO QUE PASSA. I ESTEM ACÍ A PESSAR DE LES RETICÈNCIES D´ALGUNS VALENCIANS DE COR, QUE PENSEN QUE NO SE DONEN LES CIRCUNTÀNCIES I CONDICIONS PRECISES, PERO EL TEMPS TREBALLA EN CONTRA NOSTRA I ELS NOSTRES CHIQUETS CAUEN DIA A DIA EN L´ENGANY I NO PODEM ESPERAR MÉS, S´HO ESTEM JUGANT TOT. 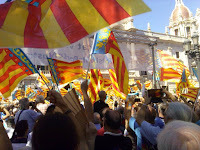 PERQUE A VALÉNCIA, I MOS REFERIM A TOT EL REGNE, SE LI ESTÀN MANIPULANT COSES FONAMENTALS: EL NOM, LA BANDERA, L´HIMNE I LO QUE MÉS: NOSTRA LLENGUA VALENCIANA, ELS SÍMBOLS QUE ACÍ, COM EN QUALSEVOL POBLE DEL MÓN, MANIFESTEN NOSTRA IDENTITAT HISTÓRICA. YA PORTEM VARIES DÉCADES EN QUE DES DE SECTORS DE FORA I DE DINS S´INTENTA FER-NOS PASSAR A UN SEGÓN LLOC EN EL CONJUNT DELS POBLES D´ESPANYA: MIREU ELS LLIBRES CATALANISATS QUE ENSENYEN ALS VOSTRES FILLS I NETS , MIREU LES PUBLICACIONS OFICIALS, MIREU LA FALTA DE RESPOSTA – NO YA VALENTA SINO SIMPLE RESPOSTA – DE NOSTRE CONSELL ALS ATACS DESCARATS DEL GOVERN CATALÀ, I ARA, L´INTENT DE CANVIAR NOSTRES COSTUMS I TRADICIONS, COM LA FESTA DEL 9 D´OCTUBRE. TOT AÇÓ NO SON ROMANÇOS, SINO LA CONSEQUÈNCIA D´UN ACTE DELIBERAT – UNA ACCIÓ ESCANDALOSA- QUE YA MOSTRAVA L´INTENCIONALITAT DE CATALANISAR, COM VA SER EL DEIXAR A BANDA A LES DOS INTITUCIONS CENTENARIES GENUINAMENT VALENCIANES EN EL CAMP DE LA LLENGUA I LA CULTURA COM SON LO RAT PENAT I LA REAL ACADÈMIA DE CULTURA VALENCIANA PER A INVENTAR-SE UNA ACADÈMIA CATALANISTA. ESTES COSES I ALGUNES MÉS NO LES ANEM A CONSENTIR ELS VALENCIANS. ESTEM AÇÍ PERQUE REBUGEM ABSOLUTAMENT LA POLÍTICA CULTURAL CATALANISTA I LA LLENGUA CATALANISÀ QUE HA INVENTAT LA TAL ACADÈMIA VALENCIANA DE LA LLENGUA ( QUE TENIA QUE HAVER-SE NOMENAT “DE LA LLENGUA VALENCIANA”, PERO QUE EL SR. ZAPLANA APANYÀ EN EL SR, PUJOL LO CONTRARI), I QUE ARA ESTAN IMPONENT PER INMERSIÓ, ES DIR, PER LA FORÇA, ELS GOVERNS DE NOSTRA GENERALITAT, ABANS DE DRETES I ARA LA COALICIÓ D´ESQUERRES. ESTEM AÇÍ PER A QUE LA SOCIETAT VALENCIANA S´ENTERE DEL DRAMA QUE VIVIM, PERQUE SI NO HO DENUNCIEM FALTARIEM A NOSTRA OBLIGACIÓ DE VALENCIANS DE DONAR TESTIMONI DEL NOSTRE TEMPS. ESTARIEM AMAGANT UNA REALITAT QUE MOS PERJUDICA I SERIEM IGUAL QUE ELS BOTIFLERS D´AHÍR I DE HUI. PERQUE QUI CALLA OTORGA I ES CONVERTIX EN COMPLIÇ. VOLEM EXPRESSAR A LA SOCIETAT VALENCIANA, A LES ASSOCIACIONS, ALS GREMIS, ALS COLEGES PROFESIONALS, A LES ASSOCIACIONS FESTERES I, EN ESPECIAL ALS QUE TENEN FILLS EN LES ESCOLES I UNIVERSITATS, DE QUE ESTAN SENT SOMESOS A UN PROCÉS DE DESPERSONALISACIÓ COM A VALENCIANS. NOS DIRIGIMOS TAMBIÉN A LOS VALENCIANOS CASTELLANOPARLANTES, , QUE AL NO DOMINAR EL IDIOMA PUEDEN SER DESCONOCEDORES DE LA GRAVEDAD DEL PROBLEMA. TAMBIÉN A LOS FORASTEROS E INMIGRANTES QUE SE HALLAN ENTRE NOSOTROS, PARA HACERLES SABER QUE ESTAMOS DEFENDIENDO NUESTRO PATRIMONIO COMO VALENCIANOS Y QUE NO ESTAMOS EN CONTRA DE NINGUNA IDEOLOGÍA POLÍTICA. TODOS DEBEN SABER QUE LA ACTITUD DE NUESTROS GOBERNANTES NO HA RESPONDIDO, DESDE HACE AÑOS, A LAS NECESIDADES DE VALENCIA EN LO QUE SE REFIERE AL MANTENIMIENTO Y DEFENSA, SI ES EL CASO, COMO LO ES AHORA, DE SU PERSONALIDAD, POR EL CONTRARIO, SU ACTITUD HA SIDO Y ES EN ESTE CAMPO NEGATIVA, LO QUE HA VENIDO PRODUCIENDO INSEGURIDAD, CONTRARIEDAD Y ENFRENTAMIENTOS, ES DECIR, ALTERACIÓN DE LA VIDA CIUDADANA, LO QUE NUNCA ANTES SE HABÍA DADO EN NUESTRA SOCIEDAD, Y LO QUE ES MÁS GRAVE , ENTRE ALUMNOS Y PROFESORES E INCLUSO ENTRE PADRES E HIJOS EN ALGUNOS CASOS. NUESTRA OBLIGACIÓN DE VALENCIANOS ES ADVERTIR A LOS QUE NOS GOBIERNAN, QUE ESE NO ES EL CAMINO, QUE UNA COSA ES GOBERNAR LEGÍTIMAMENTE POR MANDATO DE LAS URNAS Y OTRA QUERER INTERVENIR EN LO QUE AFECTA A LA IDENTIDAD HISTÓRICA DE NUESTRO PUEBLO EN FORMA DICTATORIAL Y SIN CONSULTARLE , YA QUE NO LES VOTÓ PARA ESO. ADVERTIRLES QUE GOBERNAR ES ADMINISTRAR Y GESTIONAR LA COSA PUBLICA, LO QUE PUEDE HACERSE DESDE CRITERIOS DE IZQUIERDA, DE CENTRO, DE DERECHA O LOS QUE SEAN, PERO ESA GESTIÓN NO PUEDE AFECTAR NUNCA A NUESTROS SÍMBOLOS PORQUE PERSONIFICAN LA IDENTIDAD MULTISECULAR DEL PUEBLO VALENCIANO, CONSOLIDADA Y FUNDAMENTADA EN TRES REALIDADES : LA HISTÓRICA, LA SOCIAL Y LA LEGAL, COMO ASÍ LO RECONOCEN NUESTRO ESTATUTO Y LA CONSTITUCIÓN. QUEREMOS DAR LAS GRACIAS A NUESTROS HERMANOS DE LAS EXPEDICIONES DE BALEARES Y DE MURCIA, ASÍ COMO LOS DE ARAGÓN Y EL GRUPO DE CATALANES`, DE MADRID Y DE OTRO LUGARES DE EUROPA, QUE ESTÁN AQUÍ CON NOSOTROS, ASÍ COMO LOS MENSAJES DE ÁNIMO QUE NOS LLEGAN DE BRASIL ARGENTINA, PANAMÁ Y OTROS SITIOS, QUE NOS APOYAN. UN FUERTE ABRAZO DE GRATITUD A TODOS. ENTRE ELS ANYS 1.977 I 1.982 TINGUÉ LLOC LA PRIMERA BATALLA DE VALÉNCIA EN LA QUE SALVAREM NOSTRES SENYES D´IDENTITAT, I COM ELS INVASORS NO CONSEGUIREN ELS SEUS PROPÓSITS TORNEN ARA A LA CÀRREGA, ENCARA MÉS FORTA, VOLENT-NOS INCLOURE EN ELS QUIMÉRICS I INEXISTENTS “PAISOS”, AIXINA QUE ARA S´ESTÀ INICIANT LA SEGONA BATALLA DE VALÉNCIA EN PIJORS CONDICIÓNS PERQUE ELS POLÍTICS EN ELS QUE HAVIA CONFIAT EL POBLE LI FALLAREN, PACTANT EN PUJOL I FICANT L´ACADÈMIA CATALANISTA EN L´ESTATUT, I TOT PER A PROMOCIONAR LA CULTURA CATALANA, O SIGA, TREBALLANT PER A CATALUNYA Y NO PER A VALÉNCIA, COM SEGUIXEN FENT-HO HUI UTILISANT EL LLENGUAGE CATALANISAT DE LA CONSELLERIA DE CULTURA. EN UNES CIRCUMSTÀNCIES EN QUE LA COMUNITAT NECESSITA URGENTMENT RECUPERAR-SE DE LA CRISIS QUE PATIX A TOTS ELS NIVELLS, ELS POLÍTICS NO PODEN DEDICAR-SE A CREAR PROBLEMES QUE ABANS NO EXISTIEN, NI A PROMOURE ACCIONS CLARAMENT CONTRARIES A L´ IDENTITAT VALENCIANA. ELS GOVERNANTS, SIGUEN DEL CONSELL O DELS AJUNTAMENTS, AL ACCEPTAR ELS SEUS CÀRRECS, ES COMPROMETEREN A SER FIDELS AL NOSTRE ESTATUT, - ELS FURS DE HUI,- I ESTAN OBLIGATS A RESPETAR-LO, I HO VAIG A DIR EN CASTELLÀ PER A QUE TOT LO MÓN HO ENTENGA: SIN SACAR LOS PIES DEL TIESTO, NI METERSE EN TERRENOS QUE LES ESTÁN VEDADOS. I ESTEM ACÍ TAMBÉ PERQUE NINGÚ MOS DEFÉN; ESTEM VEENT AL GOVERN CENTRAL PROTESTAR MOLT, A LA SEUA MANERA, CONTRA ARTUR MAS, PERO NO L´HEM VIST DEFENDRE A LA COMUNITAT VALENCIANA, NI A LES ILLES BALEARS, NI A ARAGÓ, PERQUE ELS VOL INCLOURE EN ELS “PASTISSOS”; NO ELS NOMENA, NI UNA SOLA PARAULA, PER ALGUAN COSA SERÀ, PERO ADVERTIM QUE VALÉNCIA NO HA SEGUT, NI ES, NI SERÁ MAI CATALANA. ¡ V I X C A V A L E N C I A ! LO PRIMERO DAROS LAS GRACIAS POR VUESTRA ASISTENCIA PORQUE SON POCAS LAS OCASIONES QUE TENEMOS DE JUNTARNOS COMO A PUEBLO Y VUESTRA PRESENCIA YA ES UNA RESPUESTA. ES MUY IMPORTANTE QUE TENGAMOS MUY CLARO, PORQUÉ ESTAMOS AQUÍ, POR ESE MOTIVO PARA DIRIGIRME A VOSOTROS -QUE ES PARA MI UN HONOR- LEERÉ UNAS LÍNEAS, PARA QUE QUEDE CONSTANCIA. ACUDIMOS HOY AQUÍ, A LA PLAZA MAYOR DEL "CAP I CASSAL" EN RESPUESTA A LA LLAMADA QUE HAN HECHO LAS ENTIDADES VALENCIANISTAS CONVOCANTES. NO ESTAMOS AQUÍ PARA DEFENDER IDEOLOGÍAS, NI INTERESES POLÍTICOS DE NINGUNA CLASE, ESTAMOS AQUÍ EXCLUSIVAMENTE COMO A VALENCIANOS PARA MANIFESTAR NUESTRA CONTRARIEDAD Y OPOSICIÓN A LOS ATAQUES, DISTORSIONES Y MANIPULACIONES QUE ESTÁ PADECIENDO VALENCIA DESDE HACE AÑOS, NO HEMOS VENIDO A UNA FIESTA SINO A UN ACTO DE PROTESTA Y ESTA ES UNA PEQUEÑA MUESTRA DE NUESTRO ENOJO. Y ESTAMOS AQUÍ A PESAR DEL BOICOT, LAS DIFICULTADES Y LOS SILENCIOS DE LOS GRUPOS DE PRESIÓN INTERESADOS EN QUE EL PUEBLO NO SE ENTERE DE LO QUE PASA. Y ESTAMOS AQUÍ A PESAR DE LAS RETICENCIAS DE ALGUNOS VALENCIANOS DE CORAZÓN, QUE PIENSAN QUE NO SE DAN LAS CIRCUNSTANCIAS Y CONDICIONES PRECISAS PERO EL TIEMPO TRABAJA EN NUESTRA CONTRA Y NUESTROS HIJOS CAEN DÍA A DÍA EN EL ENGAÑO Y NO PODEMOS ESPERAR MÁS, NOS LO ESTAMOS JUGANDO TODO. PORQUE A VALENCIA, Y NOS REFERIMOS A TODO EL REINO, SE LE ESTÁN MANIPULANDO COSAS FUNDAMENTALES: EL NOMBRE, LA BANDERA, EL HIMNO Y LO QUE MÁS: NUESTRA LENGUA VALENCIANA, LOS SÍMBOLOS QUE AQUÍ, COMO EN CUALQUIER PUEBLO DEL MUNDO, MANIFIESTAS NUESTRA IDENTIDAD HISTÓRICA. YA LLEVAMOS VARIAS DÉCADAS EN QUE DESDE SECTORES DE FUERA Y DE DENTRO SE INTENTA HACERNOS PASAR A UN SEGUNDO PLANO EN EL CONJUNTO DE LOS PUEBLOS DE ESPAÑA: MIRAR LOS LIBROS CATALANIZADOS QUE ENSEÑAN A VUESTROS HIJOS Y NIETOS, MIRAR LAS PUBLICACIONES OFICIALES, MIRAR LA FALTA DE RESPUESTA -NO YA VALIENTE, SINO SIMPLE RESPUESTA- DE NUESTRO CONSELL A LOS ATAQUES DESCARADOS DEL GOBIERNO CATALÁN, Y AHORA, EL INTENTO DE CAMBIAR NUESTRAS COSTUMBRES Y TRADICIONES, COMO LA FIESTA DEL 9 DE OCTUBRE. TODO ESO NO SON CUENTOS, SINO LA CONSECUENCIA DE UNA ACTO DELIBERADO -UNA ACCIÓN ESCANDALOSA- QUE YA MOSTRABA LA INTENCIONALIDAD DE CATALANIZAR, COMO FUE EL DEJAR A PARTE LAS DOS INSTITUCIONES CENTENARIAS GENUÍNAMENTE VALENCIANAS EN EL CAMPO DE LA LENGUA Y LA CULTURA COMO SON LO RAT PENAT Y LA REAL ACADEMIA DE CULTURA VALENCIANA PARA INVENTARSE UNA ACADEMIA CATALANISTA. ESTAS COSAS Y ALGUNAS MÁS NO LAS VAMOS A CONSENTIR LOS VALENCIANOS. ESTAMOS AQUÍ POR QUE RECHAZAMOS ABSOLUTAMENTE LA POLÍTICA CULTURAL CATALANISTA Y LA LENGUA CATALANISTA QUE HA INVENTADO LA TAL ACADEMIA VALENCIANA DE LA LENGUA (QUE TENIA QUE HABERSE LLAMADO "DE LA LENGUA VALENCIA", PERO QUE EL SR. ZAPLANA ARREGLÓ CON EL SR. PUCHOL LO CONTRARIO), Y QUE AHORA ESTÁN IMPONIENDO POR INMERSIÓN, ES DECIR, POR LA FUERZA, LOS GOBIERNOS DE NUESTRA GENERALIDAD, ANTES DE DERECHAS Y AHORA LA COALICIÓN DE IZQUIERDAS. ESTAMOS AQUÍ PARA QUE LA SOCIEDAD VALENCIANA SE ENTERE DEL DRAMA QUE VIVIMOS, PORQUE SI NO LO DENUNCIAMOS FALTARÍAMOS A NUESTRA OBLIGACIÓN DE VALENCIANOS DE DAR TESTIMONIO DE NUESTRO TIEMPO. ESTARÍAMOS ESCONDIENDO UNA REALIDAD QUE NOS PERJUDICA Y SERÍAMOS IGUAL QUE LOS "BOTIFLERS" DE AYER Y DE HOY. POR QUE QUIEN CALLA OTORGA Y SE CONVIERTE EN CÓMPLICE. QUEREMOS EXPRESAR A LA SOCIEDAD VALENCIANA, A LAS ASOCIACIONES, A LOS GREMIOS, A LOS COLEGIOS PROFESIONALES, A LAS ASOCIACIONES FESTERAS Y EN ESPECIAL A LOS QUE TIENEN HIJOS EN LAS ESCUELAS Y UNIVERSIDADES, QUE ESTÁN SIENDO SOMETIDOS A UN PROCESO DE DESPERSONALIZACIÓN COMO A VALENCIANOS. NOS DIRIGIMOS TAMBIÉN A LOS VALENCIANOS CASTELLANO-PARLANTES, QUE AL NO DOMINAR EL IDIOMA PUEDEN SER DESCONOCEDORES DE LA GRAVEDAD DEL PROBLEMA. TAMBIÉN A LOS FORASTEROS E INMIGRANTES QUE SE HALLAN ENTRE NOSOTROS, PARA HACERLES SABER QUE ESTAMOS DEFENDIENDO NUESTRO PATRIMONIO COMO VALENCIANOS Y QUE NO ESTAMOS EN CONTRA DE NINGUNA IDEOLOGÍA POLÍTICA. TODOS DEBEN SABER QUE LA ACTITUD DE NUESTROS GOBERNANTES NO HA RESPONDIDO, DESDE HACE AÑOS, A LAS NECESIDADES DE VALENCIA EN LO QUE SE REFIERE AL MANTENIMIENTO Y DEFENSA, SI ES EL CASO, COMO LO ES AHORA, DE SU PERSONALIDAD, POR EL CONTRARIO, SU ACTITUD HA SIDO Y ES EN ESTE CAMPO NEGATIVA, LO QUE HA VENIDO PRODUCIENDO INSEGURIDAD, CONTRARIEDAD Y ENFRENTAMIENTOS, ES DECIR, ALTERACIÓN DE LA VIDA CIUDADANA, LO QUE NUNCA ANTES SE HABÍA DADO EN NUESTRA SOCIEDAD, Y LO QUE ES MÁS GRAVE , ENTRE ALUMNOS Y PROFESORES E INCLUSO ENTRE PADRES E HIJOS EN ALGUNOS CASOS. QUEREMOS DAR LAS GRACIAS A NUESTROS HERMANOS DE LAS EXPEDICIONES DE BALEARES Y DE MURCIA, ASÍ COMO LOS DE ARAGÓN Y EL GRUPO DE CATALANES`, DE MADRID Y DE OTRO LUGARES DE EUROPA, QUE ESTÁN AQUÍ CON NOSOTROS, ASÍ COMO LOS MENSAJES DE ANIMO QUE NOS LLEGAN DE BRASIL ARGENTINA, PANAMÁ Y OTROS SITIOS, QUE NOS APOYAN. UN FUERTE ABRAZO DE GRATITUD A TODOS. ENTRE LOS AÑOS 1977 Y 1982 TUVO LUGAR LA PRIMERA BATALLA DE VALENCIA EN LA QUE SALVAMOS NUESTRAS SEÑAS DE IDENTIDAD, Y COMO LOS INVASORES NO CONSIGUIERON SUS PROPÓSITOS VUELVEN A LA CARGA, AÚN CON MÁS FUERZA. QUERIÉNDONOS INCLUIR EN LOS QUIMÉRICOS E INEXISTENTES "PAÍSES", ASÍ QUE AHORA SE ESTÁ INICIANDO LA SEGUNDA BATALLA DE VALENCIA EN PEORES CONDICIONES PORQUE LOS POLÍTICOS EN LOS QUE HABÍA CONFIADO EL PUEBLO LE FALLARON, PACTANDO EN PUCHOL Y PONIENDO LA ACADEMIA CATALANISTA EN EL ESTATUTO, Y TODO PARA PROMOCIONAR LA CULTURA CATALANA, O SEA, TRABAJANDO PARA CATALUÑA Y NO PARA VALENCIA, COMO SIGUEN HACIÉNDOLO HOY, UTILIZANDO EL LENGUAJE CATALANIZADO DE LA CONSELLERÍA DE CULTURA. EN UNAS CIRCUNSTANCIAS EN QUE LA COMUNIDAD NECESITA URGENTEMENTE RECUPERARSE DE LA CRISIS QUE PADECE A TODOS LOS NIVELES, LOS POLÍTICOS NO PUEDEN DEDICARSE A CREAR PROBLEMAS QUE ANTES NO EXISTÍAN, NI A PROMOVER ACCIONES CLARAMENTE CONTRARIAS A LA IDENTIDAD VALENCIANA. LOS GOBERNANTES, SEAN DEL CONSELL O DE LOS AYUNTAMIENTOS, AL ACEPTAR SUS CARGOS, SE COMPROMETEN A SER FIELES A NUESTRO ESTATUTO, -LOS FUEROS DE HOY-, Y ESTÁN OBLIGADOS A RESPETARLO, Y LO VOY A DECIR EN CASTELLANO PARA QUE TODO EL MUNDO ME ENTIENDA: SIN SACAR LOS PIES DEL TIESTO, NI METERSE EN TERRENOS QUE LES ESTÁN VEDADOS. Y ESTAMOS AQUÍ TAMBIÉN POR QUE NINGUNO NOS DEFIENDE; ESTAMOS VIENDO AL GOBIERNO CENTRAL PROTESTAR MUCHO, A SU MANERA, CONTRA ARTUR MAS, PERO NO LO HEMOS VISTO DEFENDER A LA COMUNIDAD VALENCIANA, NI A LAS ISLAS BALEARES, NI A ARAGÓN, POR QUE QUIERE INCLUIRLOS EN LOS "PAÍSES CATALANES"; NO LOS NOMBRA, NI UNA SOLA PALABRA, POR ALGO SERÁ, PERO ADVERTIMOS QUE VALENCIA, NO HA SIDO, NI ES, NI SERÁ NUNCA CATALANA. ¡VALENCIANOS, NO VAMOS A PERMITIR QUE NOS QUITEN LA IDENTIDAD QUE CONSTRUYERON EL REY D. JAIME Y NUESTROS ANTEPASADOS, Y QUE HEREDAMOS DE NUESTROS PADRES! TODOS UNIDOS BAJO NUESTRA SENYERA, GRITEMOS. ¡V I V A V A L E N C I A!